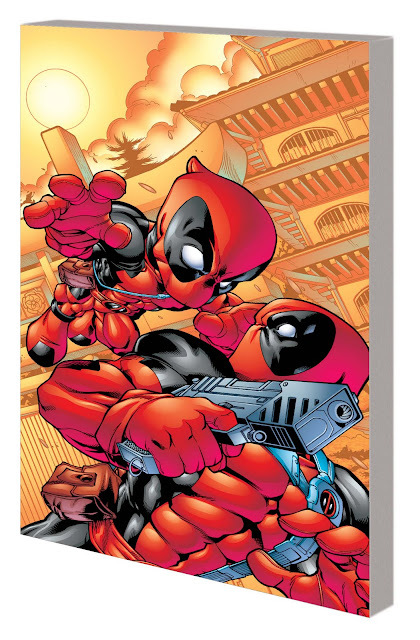 Deadpool Classic Volume 5 was announced in the June 2011 solicitations released today. Deadpool Classic Vol 5 will be released 6/1/2011. Deadpool, against the greatest threats in the Marvel Universe: Thanos! Wolverine! Bullseye! T-Ray! Dr. Bong!? Deadpool, in some of the quirkiest adventures ever seen: Sumos! Arabian princesses! Saber-toothed bunnies! Zombies! Introducing Widdle Wade, the tiny Deadpool assassin! All this and Deadpool…married?!? Plus: In BABY’S FIRST DEADPOOL BOOK, witness the most bizarre Deadpool stories ever told! Collecting DEADPOOL (1997) #26-33, BABY’S FIRST DEADPOOL BOOK and DEADPOOL TEAM-UP #1.